At The Antiquarian Book Shop, located in Georgetown - an historic neighborhood of Washington, D.C. - we have been buying, selling & appraising rare, interesting and scholarly books for nearly 25 years. Currently, our catalogued inventory includes about 5,000 books from the sixteenth century through the twentieth century in a variety of subject areas. About a third of our books are antiquarian books (published prior to 1900); the rest of our stock comprises collectible and scholarly books. 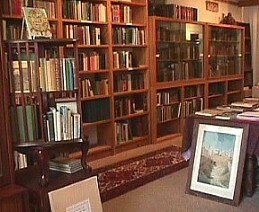 The books listed here represent only a small portion of our total inventory. We are continually cataloguing the extensive holdings in our warehouse (25,000+ books) and update these pages frequently. We have added images of many of the items listed to better convey their quality and condition. If you'd like to see an image of any particular item that is not yet illustrated, please contact us. We provide a convenient personal shopping cart system with secure order forms, and a custom search form if you’re looking for something not listed here. We hope you will enjoy browsing & searching our website and might find something you wish to purchase. Enjoy your visit.